It’s been a while since I have participated in the wonderful community event – Adopt a Gluten-free Blogger. Like the rest of you, I’m sure you read blogs and comment with the best of intentions. You put things on your “must try” list. You star them in Google Reader. You copy recipes, sometimes even going so far as printing them out and making a pile on your kitchen counter. (Please don’t tell me I’m the only one with a pile of recipes on my kitchen counter.) But, there are dishes to do and laundry to fold and your own recipes to write up and kids to pack lunches for and so on and so forth and somehow that pile stays there, untouched. The Adopt a Gluten-free blogger event is great motivation, though, to finally do something about that pile of “must-try” recipes. One blogger I’ve been reading for a while now is Allyson of Manifest Vegan. Allyson has a passionate commitment to the environment and helping to preserve the planet. But she never comes off as preachy or judgmental about her veganism. She was diagnosed with celiac disease in 2009, so everything she’s posted since then is also gluten-free. She takes brilliant food photographs – seriously, just look how gorgeous this photo is! How could you NOT want to make that? Now, you may have noticed that what I’m most passionate about in the food world is baking. One of the things I like best about her gluten-free baking is that it doesn’t have a heavy reliance on the starches and white flours. She uses a lot of sorghum, which just so happens to be my favorite gluten-free flour (and the one that I bought a 25 lb bag of from a local farmer). She does tend to use a bit more sugar than me. But, there’s a time and place for super sweet desserts, right? I made two of her recipes – the Double Chocolate Chip Cookies and the Double Chocolate Chip Banana Muffins. 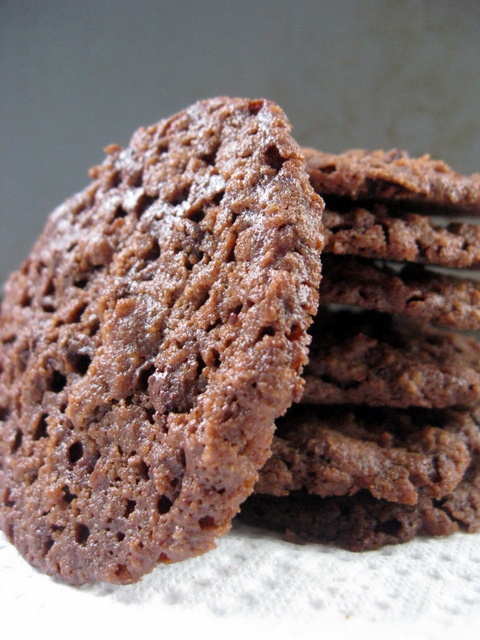 What can I say – I’m a sucker for double chocolate chip. Both of these recipes were made when I was baking for others, and both were devoured by their intended audiences. The only change I made in this recipe was to use Spectrum palm oil shortening instead of vegan margarine. I should probably have reduced the shortening just a wee bit, as the shortening has less water content than margarine, so they melted and spread a bit more. But so it goes, right? They were crisp-chewy, sweet, and oh so tasty. I left them at a friend’s house as a surprise, and when I checked back with her later her comment was, “THOSE were gluten-free? And VEGAN? You’ve GOT to be kidding me!” She declared them to be super rich and fabulous. I think we have a winner here. I made them again for the family, and we all had a similar response. They’re amazing. They’re a bit over the top for every day consumption. But, for a special cookie treat? They’re going to be hard to beat. I made the muffins because my son is “special student of the week” at school and he wanted to bring a special treat. “Something with banana, mom.” Okay, can do. Allyson has a very intriguing sounding chocolate avocado banana bread recipe. But, somehow I wasn’t sure that would go over so well with a bunch of second graders. The muffins appealed to me because they were kid-friendly, and one recipe made enough to feed the whole class. Yay! My son came home from school and announced, “The class has a message for you…..’YUUUUUUUUUM! 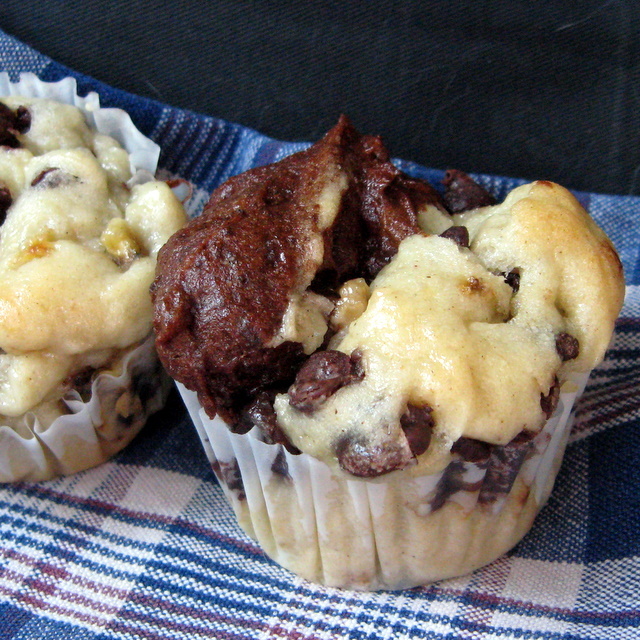 '” We had a couple leftover muffins, which the kiddo was all too happy to finish off. Truth be told, I didn’t enjoy these quite as much as the cookies. But, then, I’m not as much of a muffin lover as the kiddo. This is one of Allyson’s “starchier” recipes, which is not as much to my liking. The thing I loved about them? They rose beautifully – must be that combo of vinegar and baking powder. I honestly thought 6 teaspoons of baking powder was going to be obnoxious, but the vinegar neutralizes a lot of it and there’s no funky baking powder aftertaste – just muffins with a beautiful rise. I’m sure I’ll continue to haunt Allyson’s blog and make many more of her creations. And, I urge you to do the same!